Daft Punk is the result of the combination of the musical talents of Guy-Manuel de Homen-Christo and Thomas Bangalter. The French duo were inspired by the house movement in the 1990s and under the Scottish label Soma Records released their single “New Wave” in 1994 followed by the techno-funk joint “Da Funk” that spewed them into popularity and onto the international dance scene in 1995. Soon after forging the French techno/house scene, Daft Punk pushed the limits and infused disco, rock, pop, indie, hip-hop and grove with house sound to create a unique blend with the influences of Jimi Hendrix and The Stooges, Kiss, Television, David Bowie and Talking Heads. Guy-Manuel de Homem-Christo (born February 8, 1974) met his childhood friend Thomas Bangalter (born January 3, 1975) while they both attended the Lycee Carnot (Secondary) School in Paris. Inspired by the Beach Boys the duo became a trio in 1992 when formed they group Darlin’ with drummer Laurent Brancowitz. They recorded two tracks under the Duophonic Records owned by former alternative English music band Stereolab, and also opened for stage shows in the UK. Although they were favored with the British Music Press the group received a negative review in the music newspaper Melody Maker which branded their efforts as “a bunch of daft punk”. Undeterred Bangalter and de Homem-Christo turned the negative into a positive when they formed the group Daft Punk (after the disbandment of Darlin’). Daft Punk’s emergence onto the music scene was propelled by their meeting with the directors of the Scottish label Soma when they attended a rave at EuroDisney in 1993. They presented the label’s co-founder Stuart Macmillan with a demo tape which contained the single “New Wave” and follow-up mix “Alive”; both were later released by the label in 1994. The group gained commercial success in 1995 when they release the techno/dance/rock single “Da Funk” which had sales of 30,000 worldwide. Following the success of “Da Funk” the duo toured Europe’s rave scene and signed Pedro Winter, owner of the Hype night clubs, as their new manager. Daft Punk success on the London dance scene got them an invite to perform with one of their favorite groups The Chemical Brothers. They were signed by Virgin Records in September 1996 and the hit song “Musique” was a part of the compilation album that featured tracks from Source, The Chemical Brothers and Photek, and was produced by Virgin’s techno label Source. Daft Punk formed their production company Daft Trax and released the 1997 debut album “Homework”. The album innovatively infused techno, house, acid house, rave and electro styles, and made an impressive mark in the nineties dance music era. The most successful single from “Homework” was “Around the World”. A collection of music videos for Homework was released in 1999 and was titled D.A.F.T. : A Story about Dogs, Androids, Firemen and Tomatoes. Their second album “Discovery” was released in 2001 peaked at number two in the United Kingdom with the mainstream single “One More Time” that was listed on UK Singles chart and USA club play charter topper “Face to Face”. In 2003 Daft Punk co-created the Japanese-inspired animated film “Interstella 5555: The 5tory of the 5ecret 5tar 5ystem” with Leiji Matsumoto another child-hood hero. 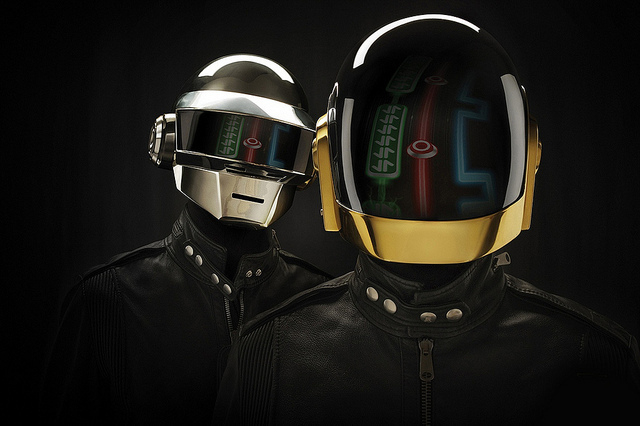 “Daft Club” was released at the end of 2003 and was used to promote the film. The album included previous unedited versions and remixes. The “Human After All” album was released in 2004 and spawned singles such as “Human After All” and “Robot Rock”. It was followed by a Daft Punk greatest hits anthology entitled Musique Vol. 1 1993–2005 released on April 4, 2006. On May 21, 2006, Daft Punk premiered their first directed film, Daft Punk’s Electroma at the Cannes Film Festival sidebar Director’s Fortnight. Throughout their career the Parisian duo have always kept their identity hidden from the public’s eyes; they wore masks for public appearances including any photo-ops for their albums. When they were not masked the Daft Punk appeared in robot disguises, or they were represented by animated characters in their videos. They did the Alive tour in 2007 and on February 8, 2009 won Grammy Awards for Alive 2007 and its single “Harder, Better, Faster, Stronger”. Though the band has no confirmed tour plans for the rest of 2009, they have alluded to performances in China in the next year or two.